You’ve loved your sofa since the day it was delivered; you always wanted that special chair in your reading nook. When something happens to your favorite upholstered furniture, it’s a big deal – but fortunately, an accidental stain doesn’t have to spell disaster. 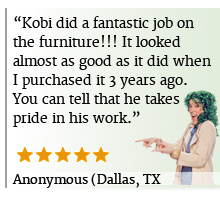 You can turn to the Dallas upholstery cleaning experts: KIWI. We’ve been in business for 30 years, and we know how to clean upholstery so it’s like-new. From white upholstery decorated with crayon marks to delicate coverings stained with lipstick or red wine, KIWI is your go-to Dallas cleaning company. Most stains on natural and synthetic fabrics can be removed… if you know what you’re doing. Many people try to remove stains and spills with DIY methods, but that often results in bleaching, bleeding or even tearing of delicate fabric. Don’t let that happen to your upholstery. Let KIWI’s experts handle the tough stuff so you can enjoy your furniture without worrying about lasting effects. At KIWI, our team of professionals can do more than remove stains. We also provide full-spectrum services that can freshen an entire furniture set and leave it looking just like new. Our furniture cleaning specialists do an exceptional job without the need to steam clean. One of the things our Dallas upholstery cleaning customers appreciate most is that we’ll provide on-site services. You don’t have to lug heavy furniture to a warehouse or wait for a pick-up appointment that can take weeks to book; we specialize in on-site upholstery cleaning all over the Dallas area. That way, we can get the job done and get out, leaving you to enjoy your furniture with family and friends. “Ya’ll were out recently and I had Anthony as my technician. Anthony was so nice, he could have not been more professional and he did a really nice job.” Dottin E.
“My technician was on time- right on the nose. And he was professional and did a great job.” Bill S.
“I am so happy with the service that Walter did. Walter did a superb job on the pet stains. Can you believe it, he got them up with the general cleaning? I did not have to pay extra for them. I am so happy to have my nice clean carpets back!” – Ann W.
“Chris did a very nice job, I am very please with my cleaning. He was very nice man to work with.” – Ivey E.
Call KIWI. We Can Help. Call us at 972-354-0164. We’ll be happy to talk about how we can remove stains and perform general upholstery cleaning services right in your Dallas home. Our work is fast, efficient and effective; that’s the KIWI way.